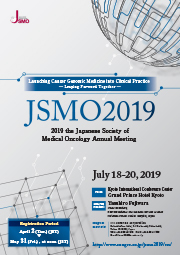 We planned to hold "Meet the Experts" sessions in JSMO2019. Each session is 60 minutes, and we have about 17 sessions during the conference from July 18 (Thu.) to 20 (Sat.). Meet the Experts session is a 60-minute small session constituted by an expert, a moderator and around 15-20 participants. The expert who delivers a lecture is a member of "International Steering Committee" organized by JSMO, and the members were selected as a well-known excellent doctor from the main facilities related to cancer in each country. The purpose of this session is to provide an opportunity to talk to the experts of their research field frankly, and to exchange the participants' opinions freely. We would like to offer you free registration to congratulate our first time of holding such sessions in JSMO conference. To participate in the session, pre-registration is required since the seats for each session are limited. The pre-registration will be available in late May. Come to visit our website around the time and do not miss the chance to find your mentor! Further details such as the session date will be announced later. Immuno-precision medicine in gastric cancer; How to select the proper patients?